The FC-3 offers extremely quiet, efficient drying of floors, walls, and ceilings. With three height adjustment settings, as well as three fan speeds, this unit can be used in a variety of applications. The 1/3 HP motor delivers up to 1,900 CFM while drawing under 3 amps. The FC-3 is equiped with a 15A duplex outlet, allowing the user to “daisy-chain” up to five fans together on a single 15A circuit. 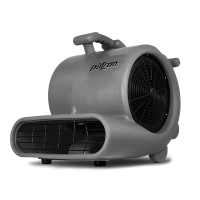 Designed for easy storage and portability, the fan is stackable, and includes a built-in carrying handle and cord-wrap - all while weighing under 22 lbs.